Elaine Mears, Tara Breathnach, Sarah-Jane Scott, Margaret Keohane. Photo:- Boyd Challenger. DRUID THEATRE Company has announced its four artists for this year's FUEL residency - Tara Breathnach, Mags Keohane, Elaine Mears, and Sarah-Jane Scott - all of whom are based in Galway. 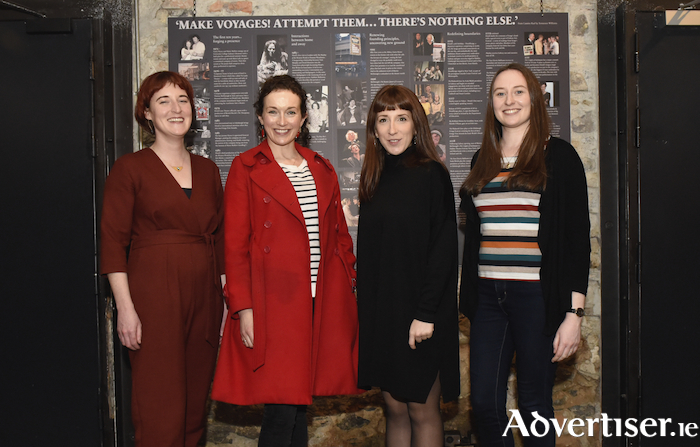 The four will create a new theatre piece during the nine month FUEL programme which includes mentorship, workshops, residency periods, a showcase event in The Mick Lally Theatre, networking events, funding, and producing advice. Tara Breathnach is a Galway-born actor and theatre maker. Her FUEL project, A Creature Uncommon, is a one-woman piece inspired by the 18th century Irish actress Peg Woffington, noted in Dublin and London for her cross-dressing 'breeches roles', numerous lovers, and green room rivalries. Mags Keohane is a director, theatre maker, and producer. During FUEL, she will develop a show inspired by personal accounts from the Irish Rwandan Support Group 1994 - Ireland's first unarmed humanitarian mission. Elaine Mears is a theatre maker, visual artist, costume and set designer. For FUEL, she will further develop Una, a theatre production based on Galway legend Una Taaffe. Sarah-Jane Scott is a playwright and actor from Tuam, who as part of FUEL, will develop a dark comedy about friendships, emotional abuse, and kleptomania.